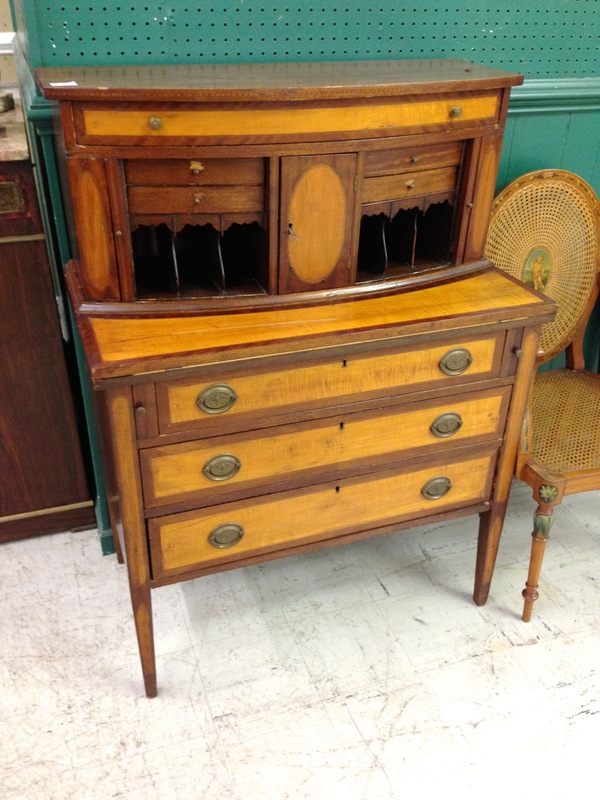 It had been days since I looked at old furniture. I was in the early stages of withdrawal. 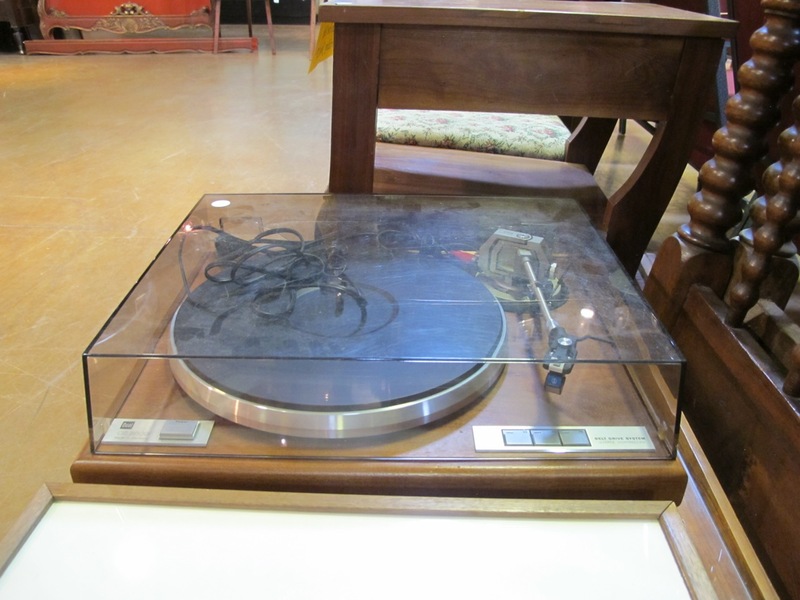 Fortunately a local auction house had a preview that very day. I went and saw many wonderous things. And a few mundanes. And I took lots of PICTURES. One desk caused me to stop and think for a bit. At first it didn’t make sense. I stared for a while and finally figured out what was going on. The only question now was if this was a creative correction of an oversight or was this the plan the whole time. A nice desk but nothing out of the ordinary. One just like it on the left side of the drawer. Stop and think about this for a minute. 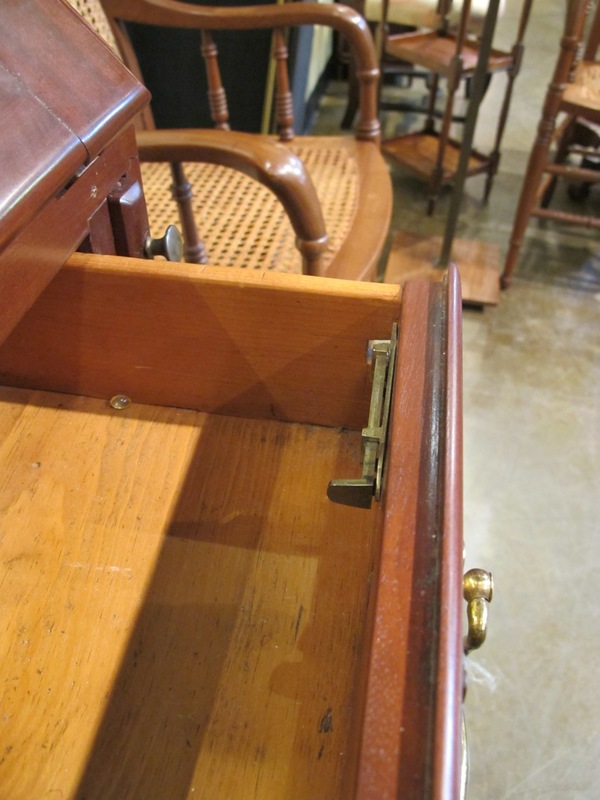 There are two sliding bolts on the inside of a drawer that can only be accessed when the drawer is open. Makes them a little less useful than one would hope. Being a curious lad, I looked for an explanation. I examined the desk and finally came up with a working hypothesis. Nice but nothing out of the ordinary. 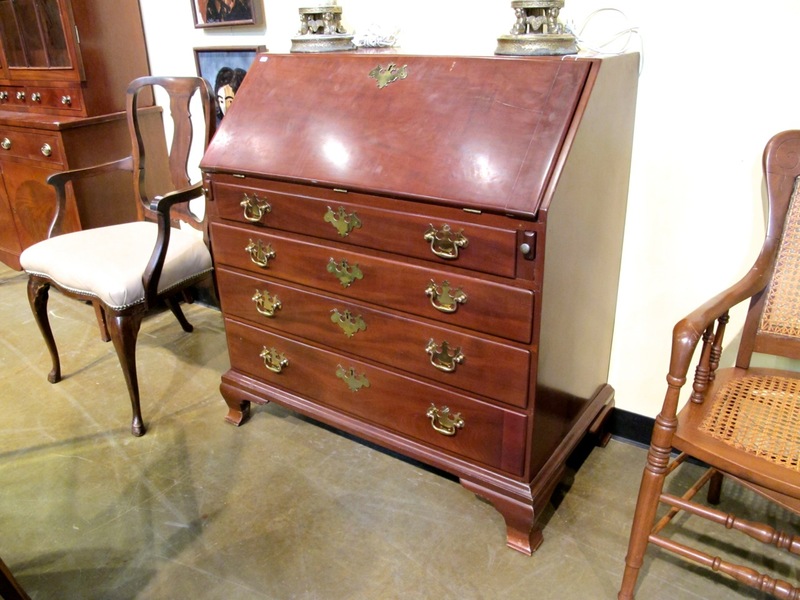 Like many similar desks, it has a sliding panel to allow you to quickly store your papers out of view. One way to quickly clear your desk. Back to my original question, was this a correction to an oversight or the way it was designed to work from the beginning? 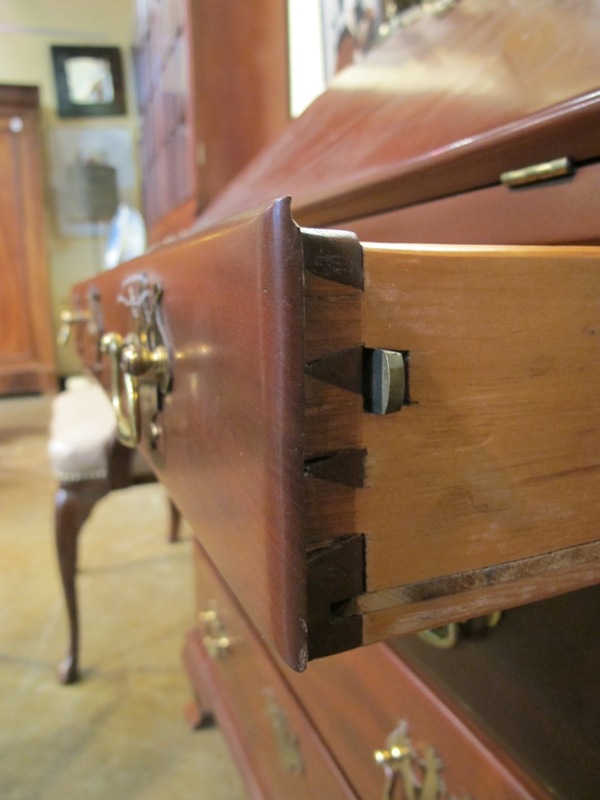 Wouldn’t it have been easier to just add a lock to the drawer? What do I know? Might just be the way it was done. 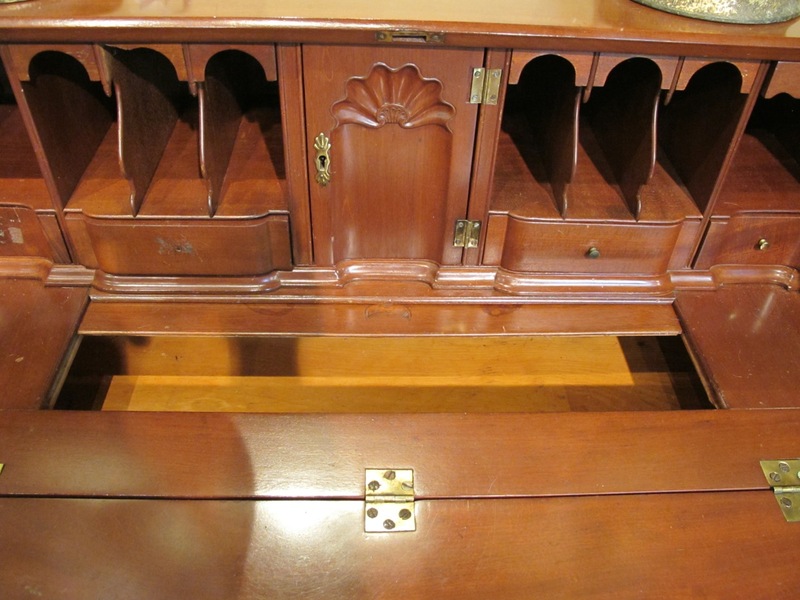 Small cabinet on top is not part of the chest. Interesting details on the legs and upper carcass. Might have to try this on my next shaker chest. 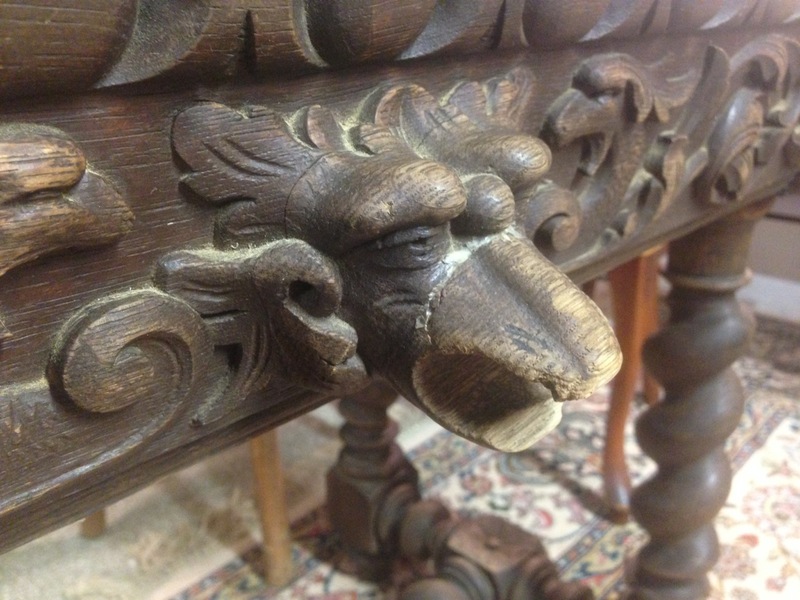 This desk looked just like one at a local antiques mall. I blogged about this one. And finally there was this odd item. I know my grandfather had one of these. Don’t remember what it is called and a Google image search turned up nothing. More once common items that have fallen from our collective consciences. Oh well. To see the entire set from this auction, click THESE WORDS. I didn’t win this one. I turned the knob, too. I couldn’t find a brass equivalent. I was pleased with the build. Only thing I believe I got wrong was the angle of the cut-a-way for the lid. I didn’t pick the color, the recipient did. My mistake was picking up a milk paint sample chart from an antiques dealer 80 miles from home. I did find a local dealer but would have preferred she had chosen one of the General Finishes acrylic “milk paint” over the mix-me-up powdered genuine milk paint. She also wanted a more primitive finish, not the smooth and uniform finish that I usually try for. Just like Peter Follansbee not letting me make the English jointed stool too pretty when I took the class at the Woodwright’s School. 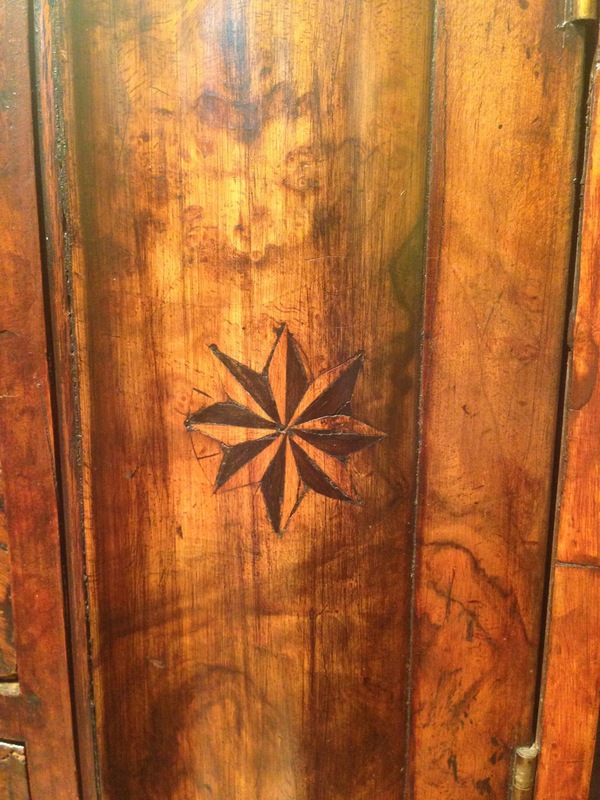 If you read Chris Schwarz’s blog at either Popular Woodworking or Lost Art Press, you know he has been writing about historic squares in the past month or two. The squares looked like an interesting project, relatively quick to build and not requiring much material. (No trip to the Hardwood Store.) As a woodworker with ADD, I am always looking for a diversion and something to keep me from doing what must be done. These fit the bill. Walnut, I have lots of walnut. It was a rewarding build. Hadn’t really used hollows and rounds to any great extent. I scratched the bead on the Melencolia square with a #66 beading tool. The challenge is to figure out the sequence of using the planes and the best way to rough out the molding profiles before using the molding planes. I have been taught it is best to use a block or other plane to remove most of the wood before switching to the hollows and rounds to refine the shape. Block planes are easier to sharpen than a molding plane. From the front, the Melencolia squares, the Wierix squares and ‘Der Schreiner’ squares. I made multiples because it is easier to make longer moldings than shorter ones. I have learned my lesson there. Now I have to find something to do with the spares. Always my problem, what to do with the stuff I make. Not a bad problem to have. Beats gout. Craving adventure and a need to explore the unknown, I went over to Raleigh Friday morning for an Antiques Extravaganza. Wandering around, I found a dealer with tools for sale. 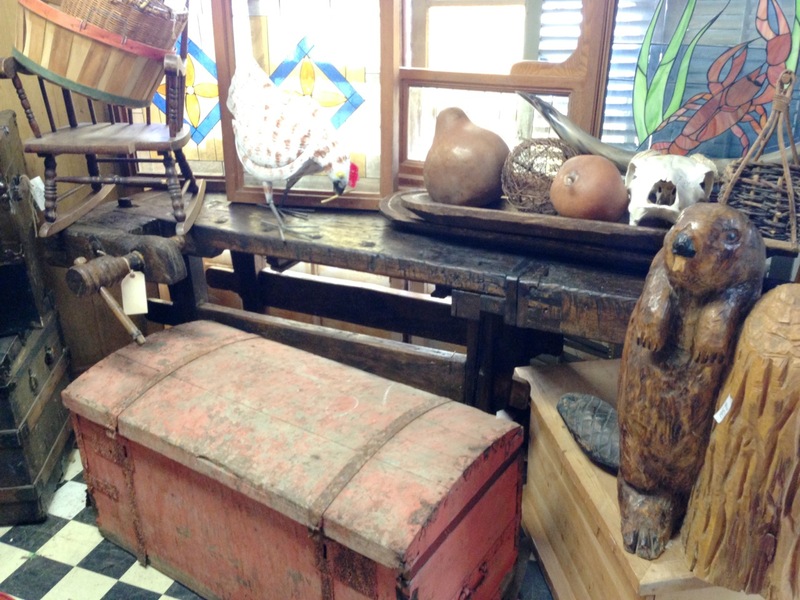 Antiques and tools, could it get any better? I did something unusual and actually bought something. It is a tool, attractive and didn’t cost much. Perfect. That is until I got home and started examining the gauge. The description doesn’t hold up to close scrutiny. 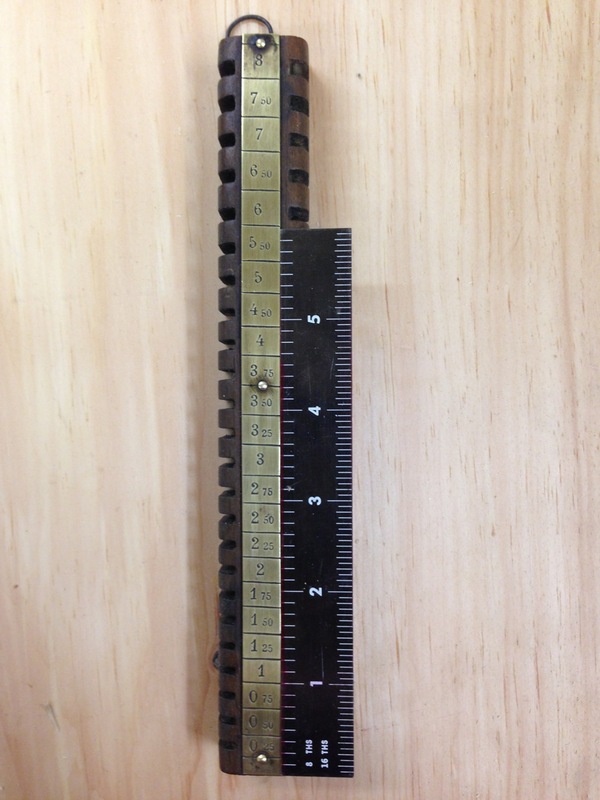 The slots on the lower half are all around 1/16″. 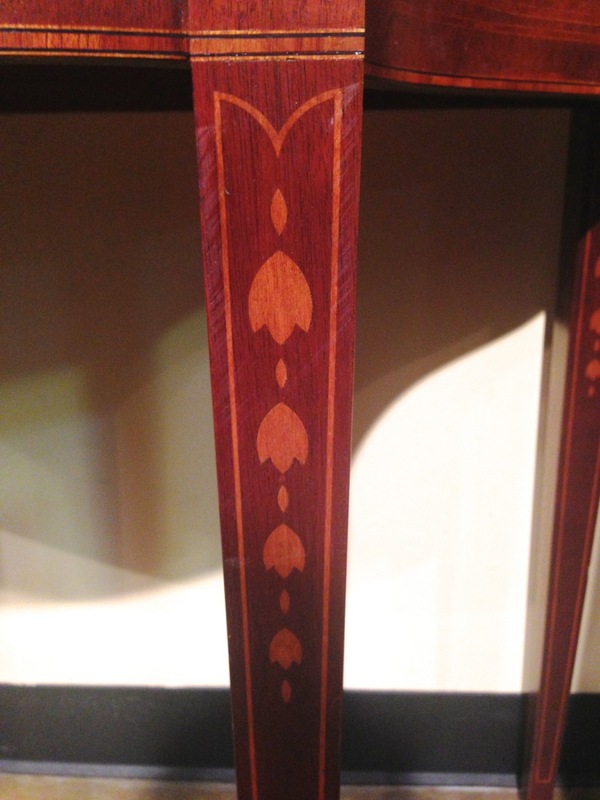 The slots in the upper half also seem to be of similar widths that bear no obvious correlation to the markings. And then there are the markings. 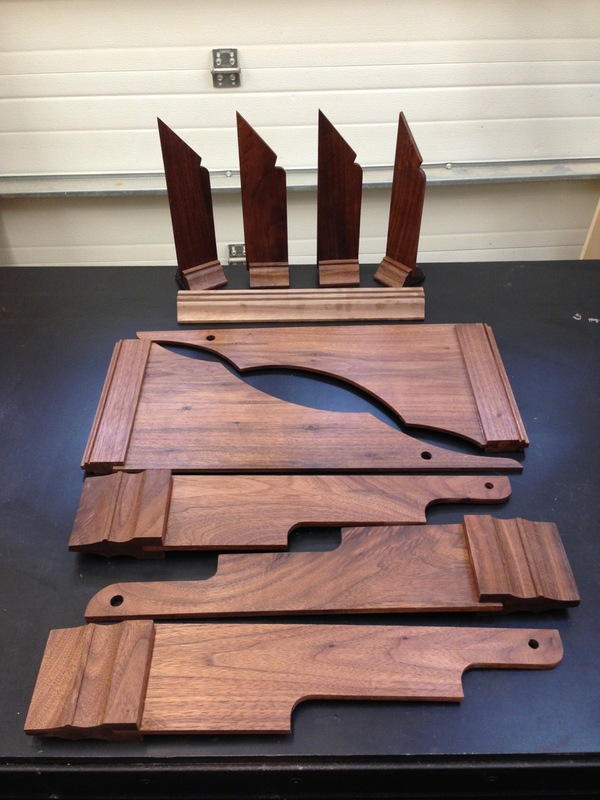 What veneer is dimensioned from 0.25 to 8? I thought the marks might be marking off 1/4″ increments. At 6″, the marks seem close. 6″ is close to the 6 mark. But not the 5, 4, 3 or 2. Then I noticed the tick marks are uniformly spaced but the numbers below 6 are marked in quarters, X.25, X.50, X.75. Above 6 only X.50. 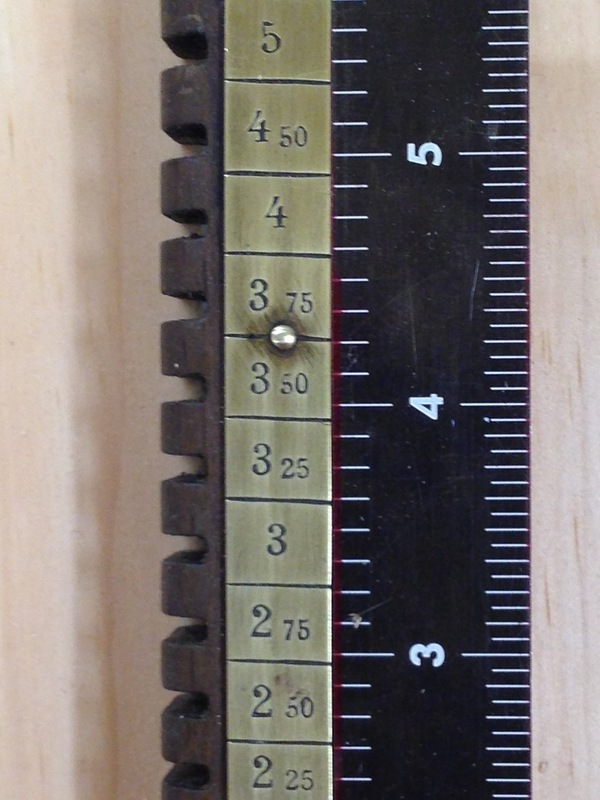 The tick marks are 1.5% out of horizontal and about 0.35″ (8.89 mm) apart. The wood doesn’t really look old. What does it measure? 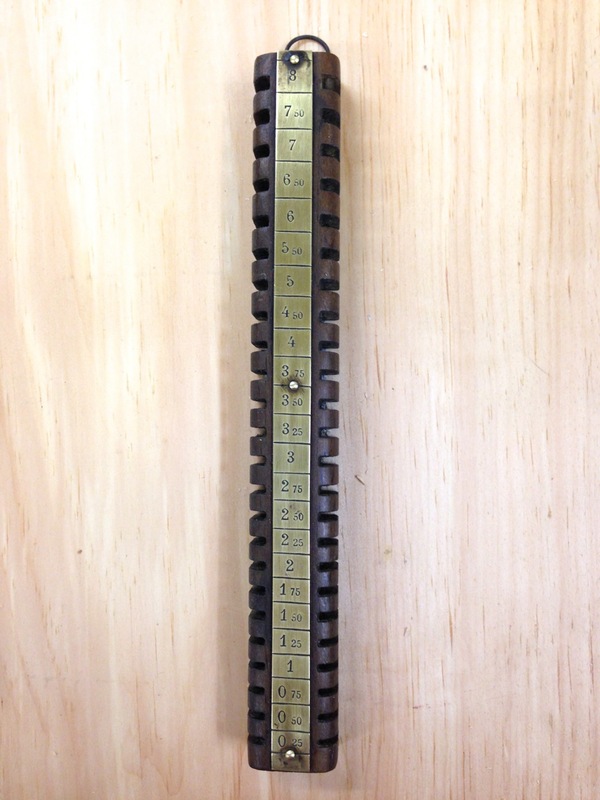 Is is just an old brass strip added to new wood? And what did the brass strip come from? A few months back I had one of those very long antiquing days. When I am driving somewhere, I try to plans the drive to maximize the number of antique shops and museums. I started the day with a 90 minute drive to my favorite four acre antique shop. 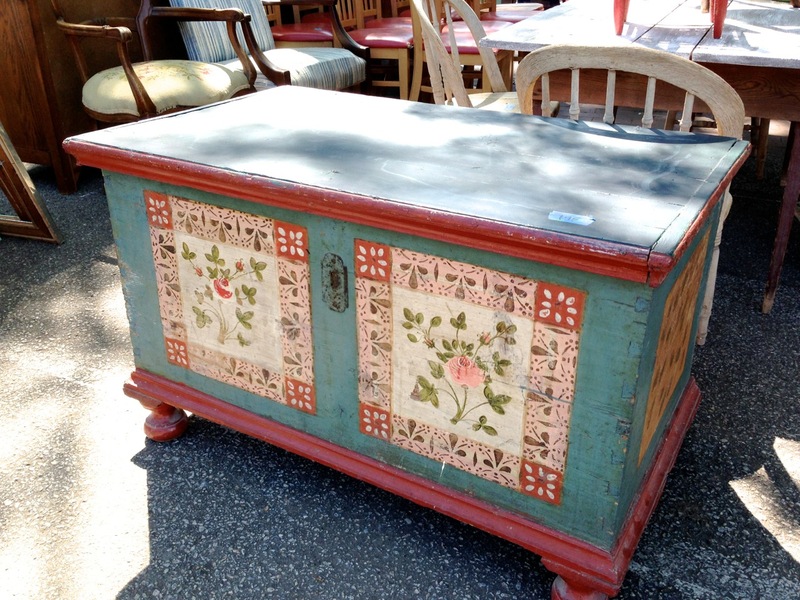 Many of the painted chests from this shop were covered in the 172 pictures in a PREVIOUS BLOG. Then a mile down to an always interesting auction house. And a drive to Stantonsburg only to discover most of the good shops are closed on Wednesday. Who knew? Next was a drive south hitting every promising antiques shop until I ran out of time in Lumberton, NC at 6:00 PM. I did visit lots of dealers and took too many pictures. And now I’m going to share. that doesn’t have any drawers. 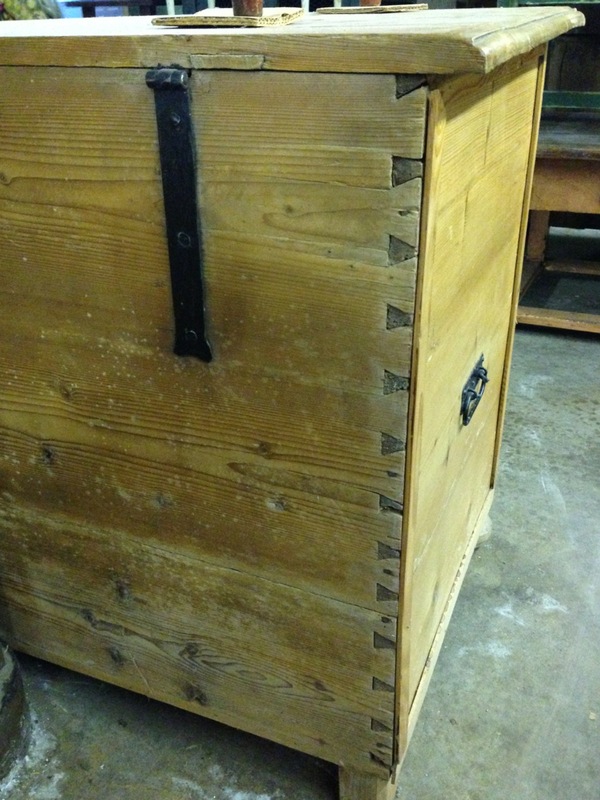 The hinge tells me it is a chest with faux drawer fronts. 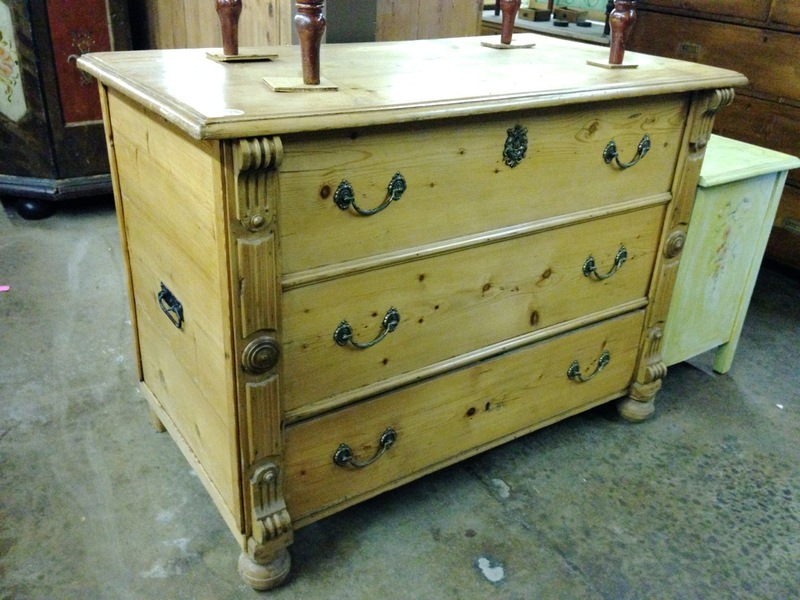 Ever see a chest you really like but aren’t sure what the primary wood is? Nice chest. What is it? Just look in the drawers. 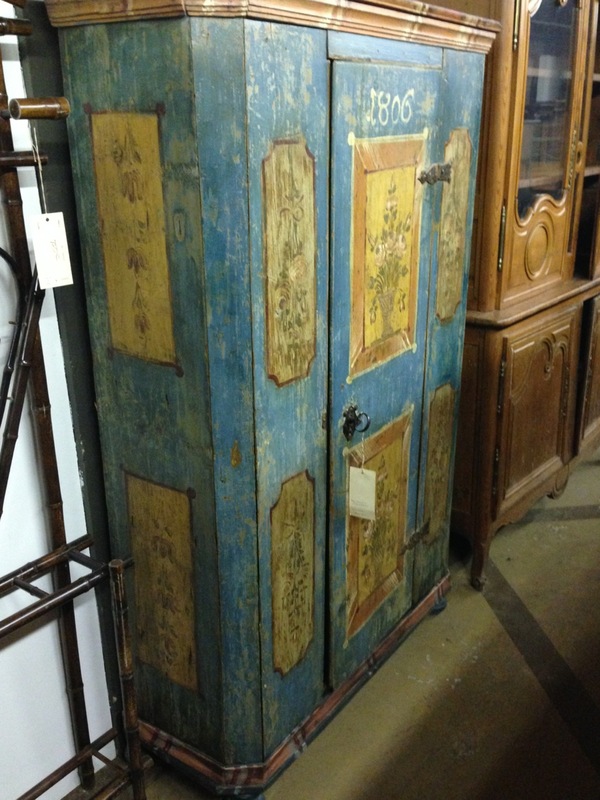 I do have a fondness for painted armoires. This one is no exception. 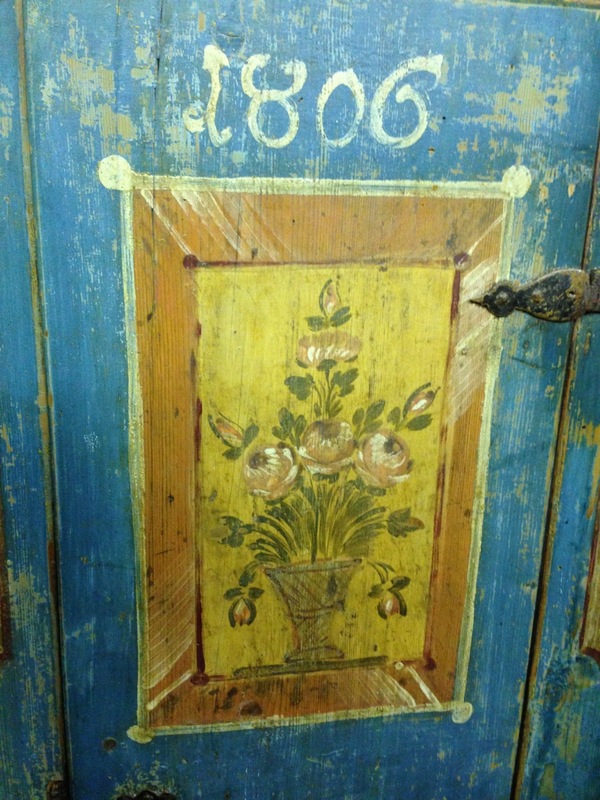 I don’t always like painted furniture, but when I do, I look at armoires. It has some very nice details on the door. 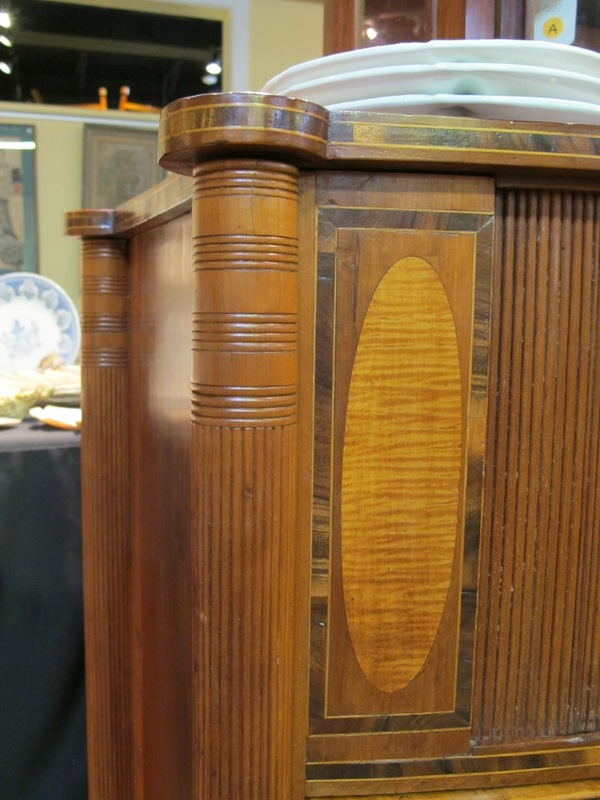 I really liked this piece but no place to put it and no patience for sitting through an auction watching people buying stuff I don’t care about. Nice piece that went home with someone else. And the last preview is my favorite lock. One lock, two drawers. And it’s French, typically. For those new to this lock, the lock has two bolts. One is high and goes to the right. The other bolt is low and goes to the left. 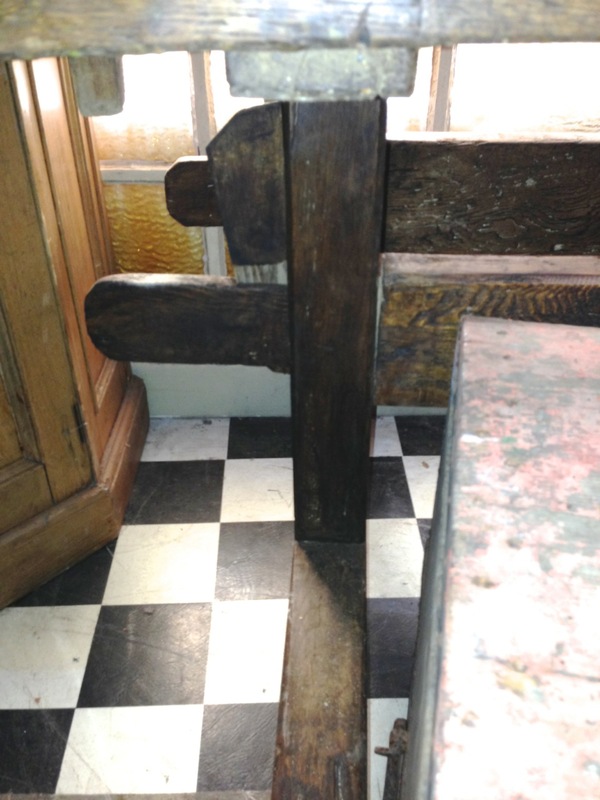 Both drawers have appropriate mortises for the bolts. This lets you lock two drawers with one lock. I really want one of those locks. If anyone knows the name of this lock or where to buy one, I would be forever in your debt if you shared. To see more of these and lots of interesting things (bellflowers), click HERE. Living in Kennett Square, PA my wife and I were spoiled. The magnificent Longwood Gardens became a place that we could get a quick dinner and take a long walk all summer. Henry Francis du Pont’s Winterthur was where we took our Sunday morning walks. We were members of both places and visited them both as often as we could. No house guest could avoid a trip and no one ever complained. Both have Yuletide displays that we have visited at least 18 times in the past 21 years. Both are former du Pont estates that have become non-profits to allow the public to come and see what these families had built and loved. And if you can avoid some taxes, that’s nice too. 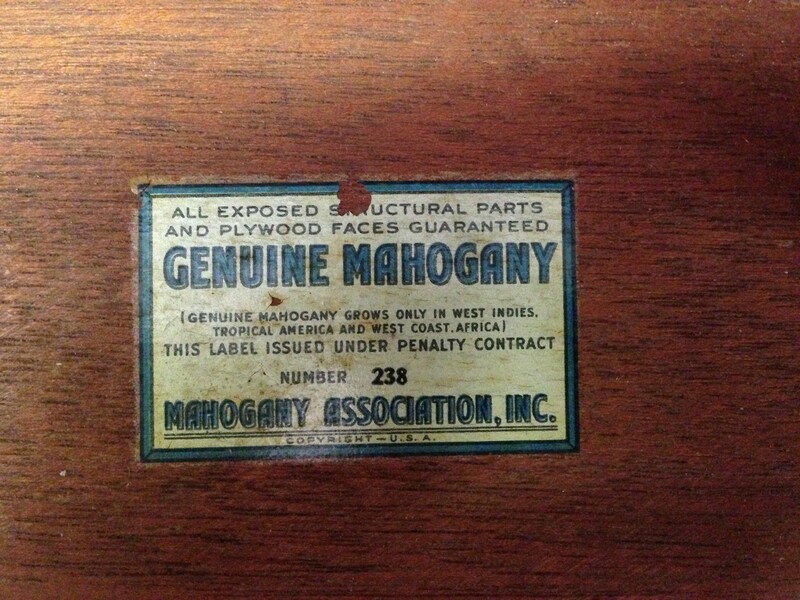 There are two other du Pont properties of note in the area, The Hagley, E.I. du Pont’s orignal gunpowder mill and mansion that now also houses a research library and the Nemours Mansion and Gardens, a 300 acre estate with formal gardens and a classical French mansion. Also on the property is the renowned Nemours/Alfred I. duPont Hospital for Children. A really good use of their money. But we’re here to talk about Winterthur, Henry Francis du Pont’s obsession. 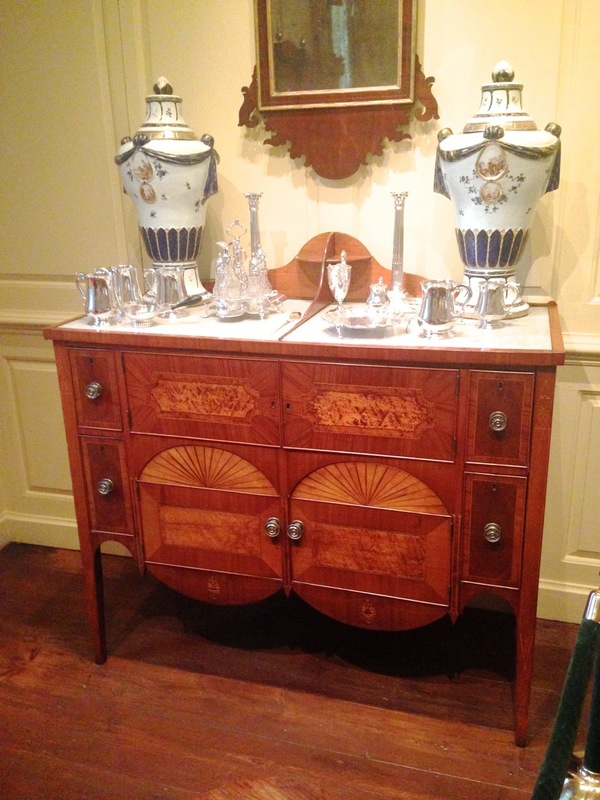 As copied from their website we learn: Founded by Henry Francis du Pont, Winterthur (pronounced “winter-tour”) is the premier museum of American decorative arts, reflecting both early America and the du Pont family’s life here. Its 60-acre naturalistic garden is among the country’s best, and its research library serves scholars from around the world. We invite you to visit and explore this place of beauty, history, and learning. The largest portion of the museum is the over 170 period room displays featuring over 85,000 objects. 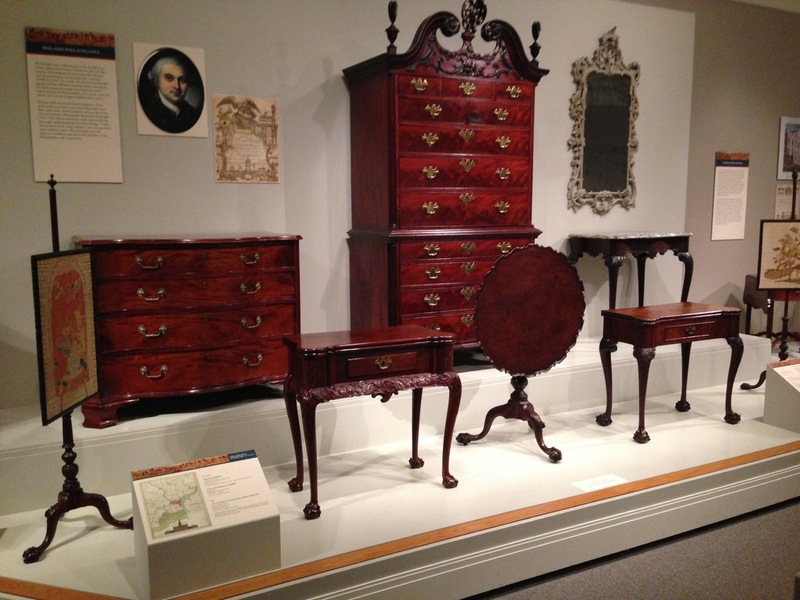 Mr. du Pont collected primarily Americana from 1640 to 1860. Period rooms are only available through one of their several standard tours or by arranging a private special interest tour. 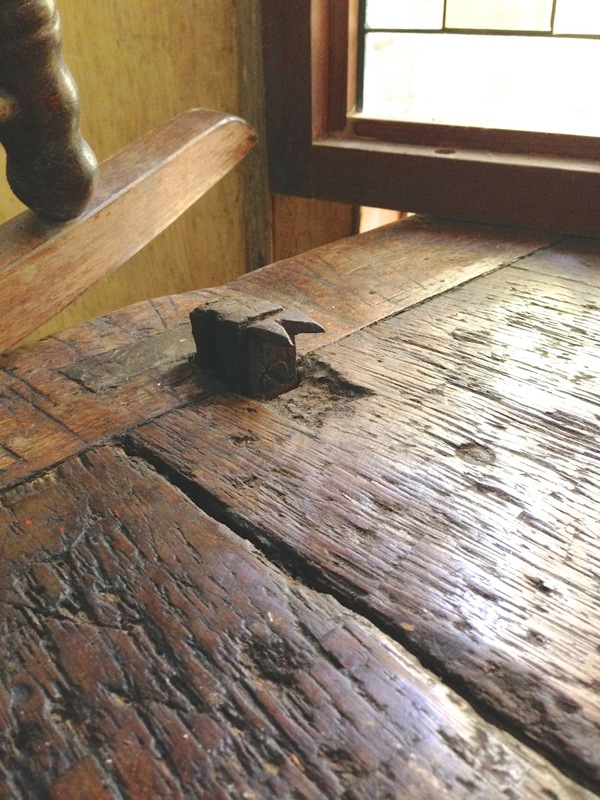 A small view of one of the 175 period rooms. In the 1990’s they built a more formal museum that features permanent and rotating displays. Much to my dismay, they are now featuring the Costumes of Downton Abbey. That ain’t Americana although it might be good business. 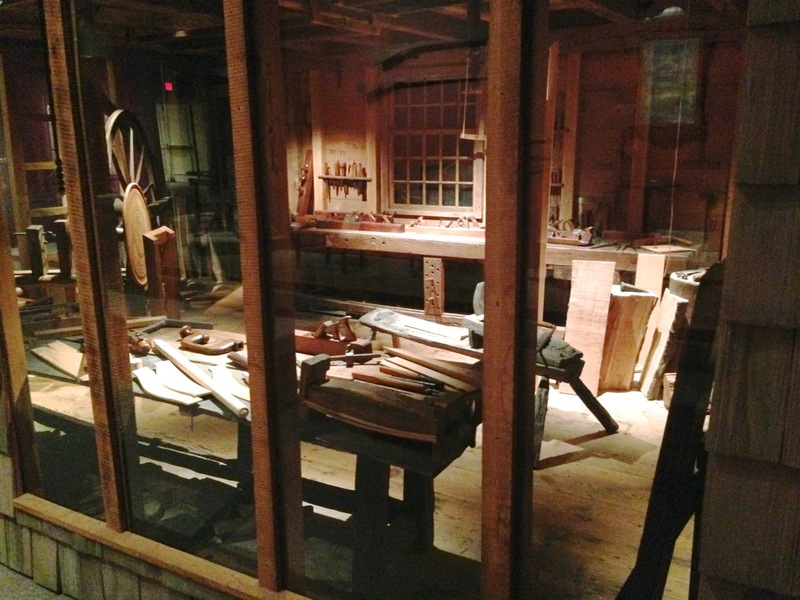 On the second floor of the museum is reconstructions of the Dominy clock and woodworking shops used by the Dominy family’s four generations of craftsmen working in East Hampton, New York, from the mid-1700s to the mid-1800s. One view of the Dominy woodworking shop. 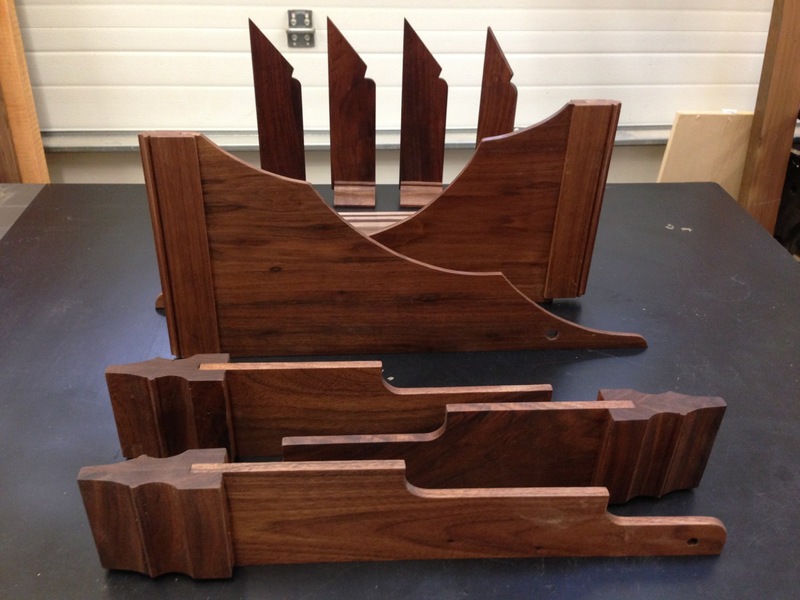 Chris Schwarz (Popular Woodworking, Lost Art Press, Goetta Illustrated) wrote a blog about the Dominy workbench back in 2007. 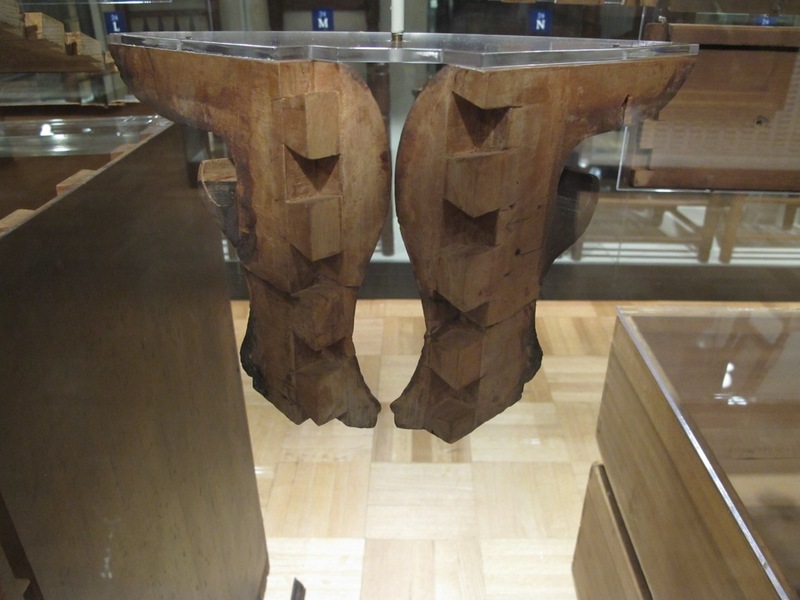 The first floor displays highlights of the collections including furniture, glass, ceramics and textiles. When I was there last they were displaying some of Philadelphia’s finest. 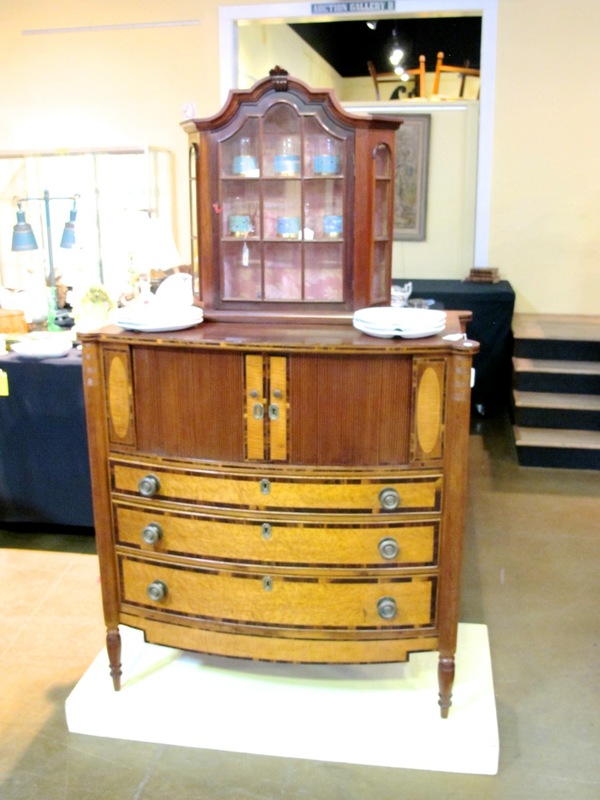 To view a small portion of the Winterthur collection, click HERE. Much to my surprise, most people have not been to New York City. I think a lot of people (me) just assume that others have had similar life experiences, been where we’ve been and know what we know. I am finding out that this is not true. Most people have not been to New York City. Or Saint Petersburg. Or Singapore. Or South Padre Island. Knowing this, it is incumbent upon me to share what I have seen and learned. Noblesse oblige. 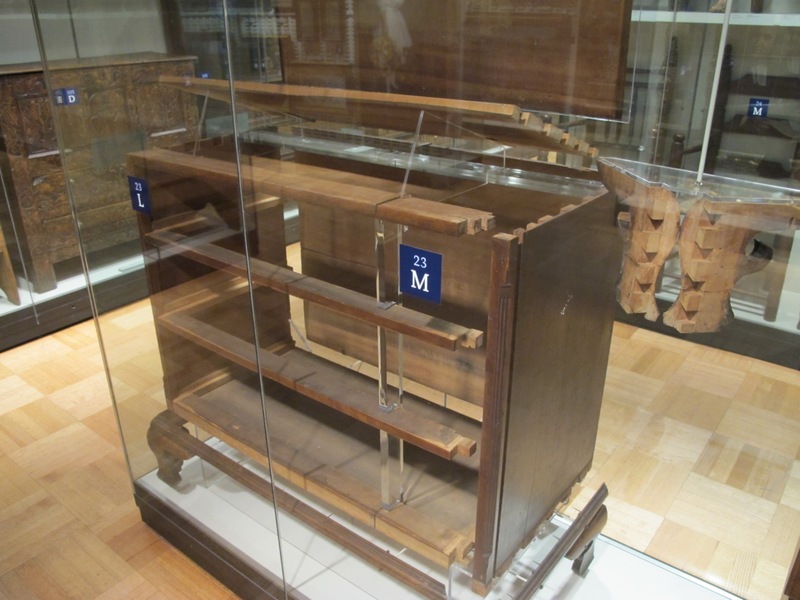 Gallery 774 – Luce Center Visible Storage at The Metropolitan Museum of Art is an amazing place. 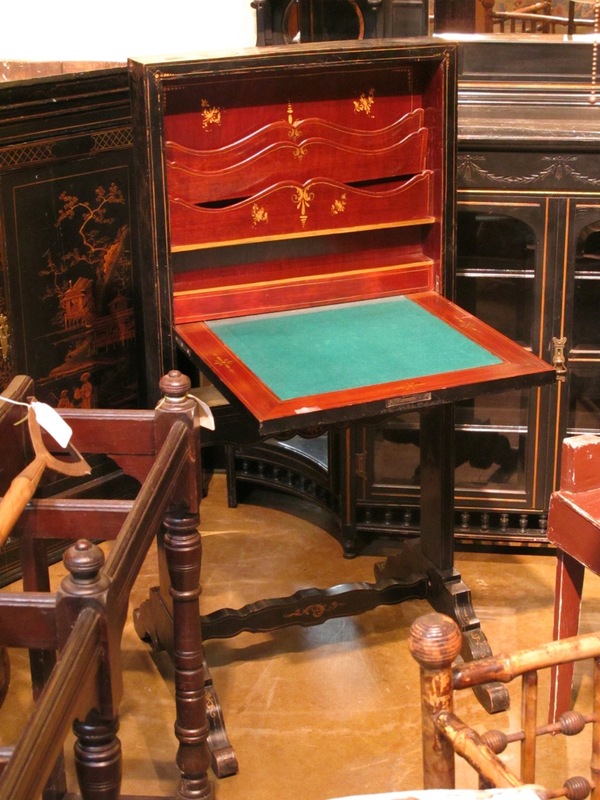 To cut and paste from their site: The Henry R. Luce Center for the Study of American Art is a visible-storage facility that displays more than ten thousand works of American fine and decorative art. It is a large gallery with row after row of display cases filled with treasures in a rather high density display setting. And everything is under glass. Or behind it. Like most museums, The Met (we sophisticates call it “The Met”) has more in it’s collections than it can display. Even a place as big as The Met. 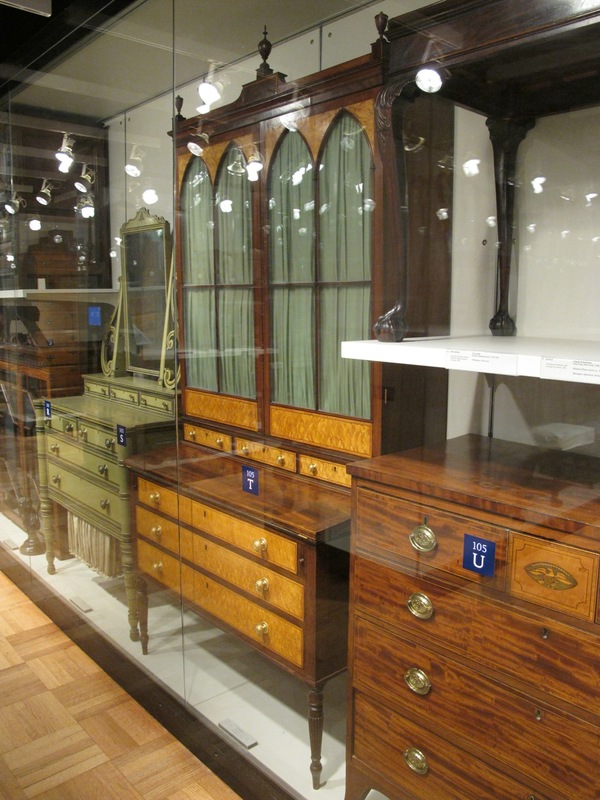 Visible Storage gives us a chance to see another 10,000 items from their American fine and decorative arts collection. And that ain’t bad. Fancy enough for you, Chuck? 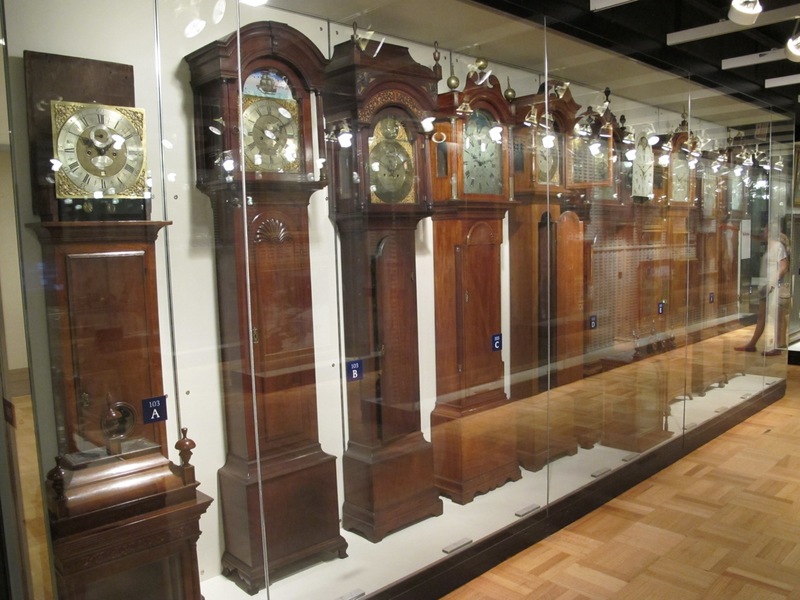 These are just some of the case clocks. 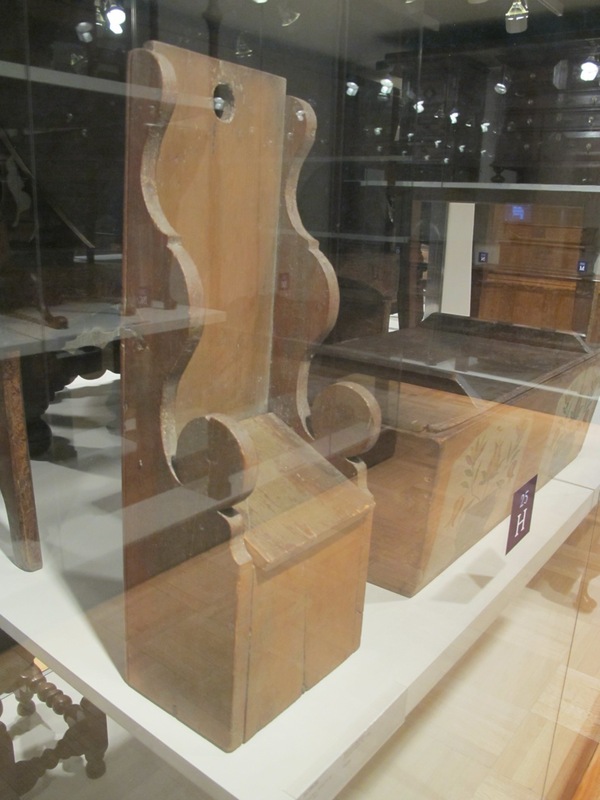 Exploded to allow you study the joinery. And that’s how you make a blind dovetail. Click HERE to see the Visible Storage. The one annoying thing was that it was all behind glass. This made photography more challenging, all those reflections and all that glare. I didn’t think to buy a polarizing filter for my Canon G11. I was told that there was a person that opens the display cases for bloggers but she was off Mondays. It might seem odd to bring up the French on Independence Day, but as all serious students of history know, we might not have become independent with out their help. Some say* that the French did not love us as much as they hated the British, but then again, it’s not clear that America’s motives have always been pure. You learn something new every day where we first met the fiche hinge. Fiche hinge. 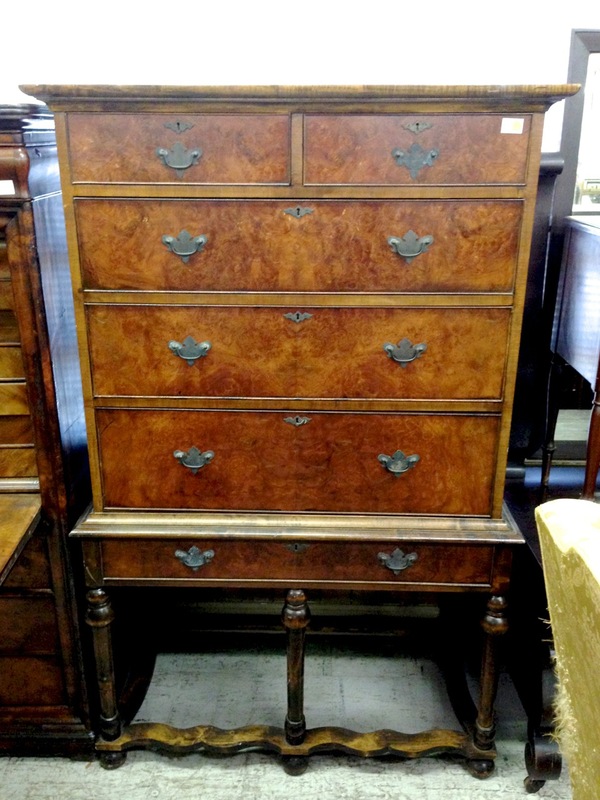 Image pilfered from Whitechapel Ltd. Click on the image to see the blog. And now we resume our regularly scheduled progamming… where we examine fiche hinge variants. Interior view. Click to read the blog. I know I’ve said this before but this is weird, the odd armoire that divides in half, left to right? 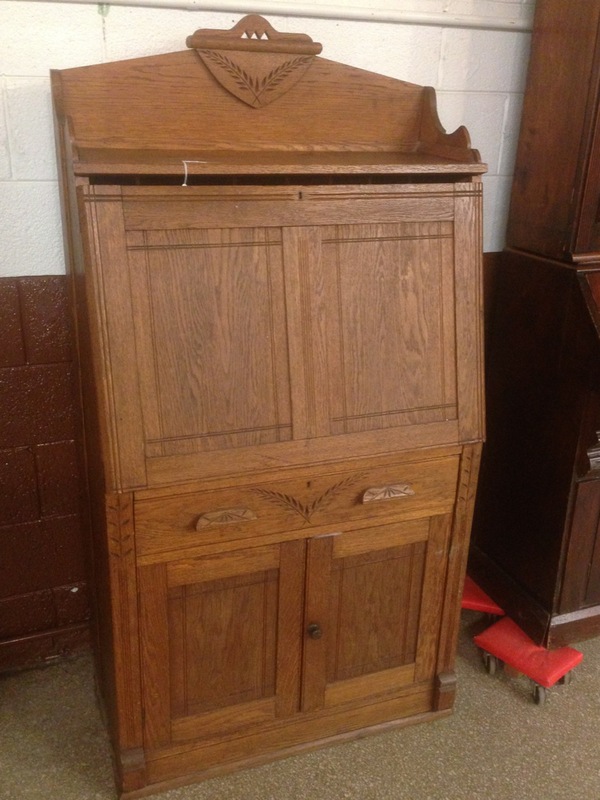 One big happy armoire. It might have been given the shabby chic treatment or been white from the factory. Click to revisit this blog. 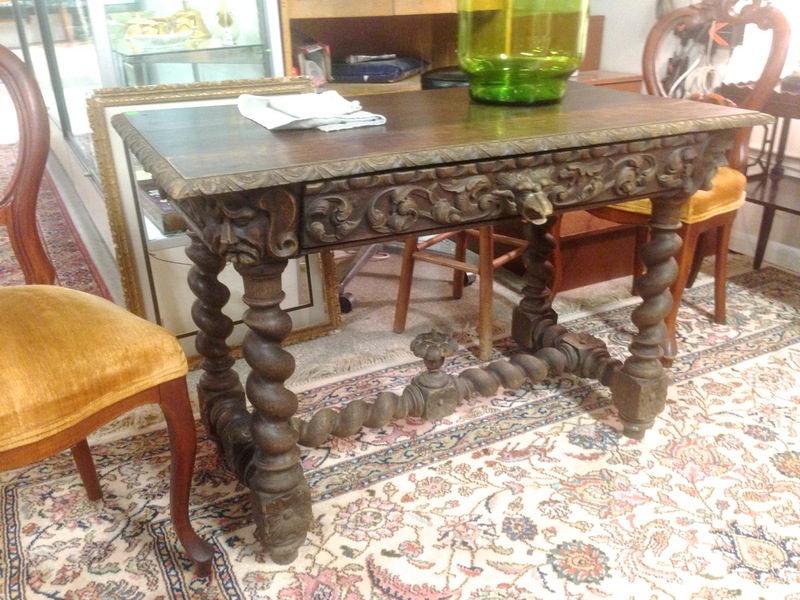 It’s a French Thing, a few French pieces from my favorite consignment shop. There be carvings. Every where. Click the image to view the blog. 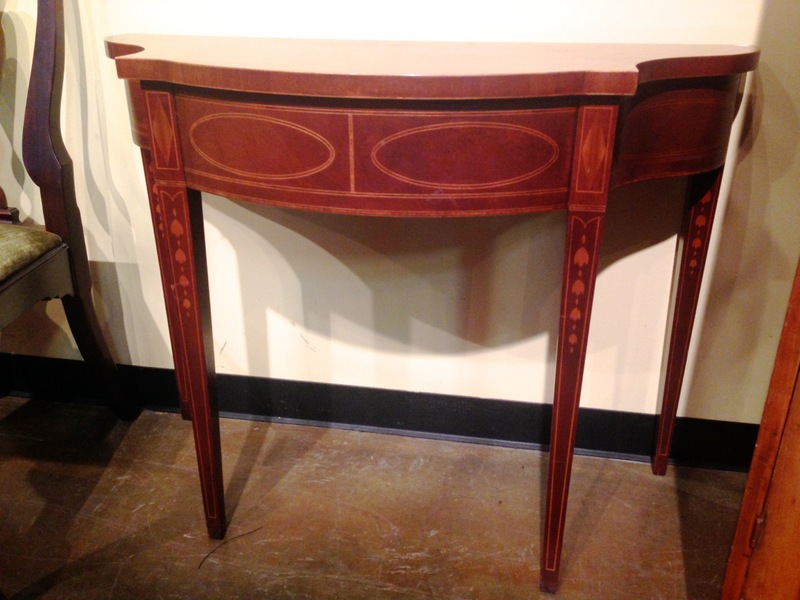 And Now, the French Content, the French furniture from Denham Springs, LA. A typical French clock. Click and read. If you want to. Teeth meant to hold wood. Seriously. There is a bench in that pile, really. Some of them parts come out allowing disassembly and easy transport. THIS is a set of all the pictures I have of this bench. Denham Spring had a wide assortment of dealers and inventory. Since we are revisiting the bench, we might as well go back and visit the whole Denham Springs blog and photo set. To go back and experience the blog, click HERE. 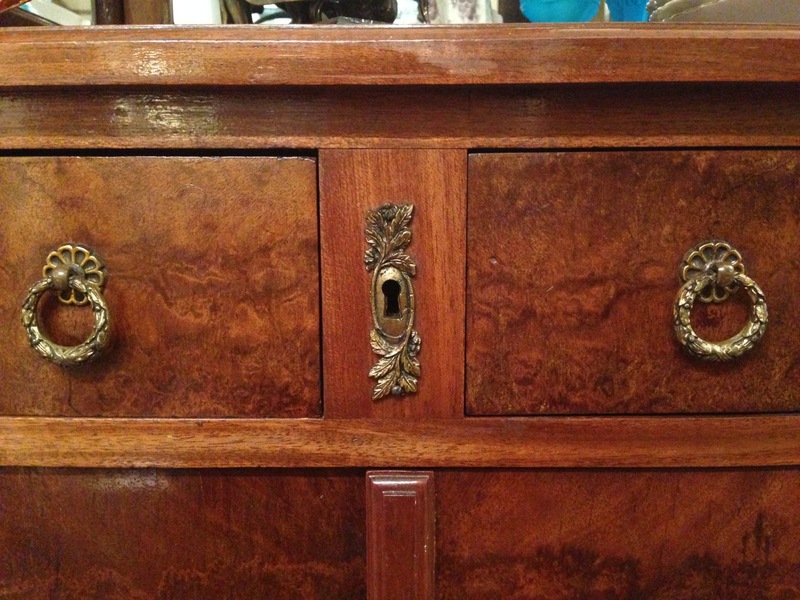 You might not know this but I try to get out and look at antiques every once in a while. 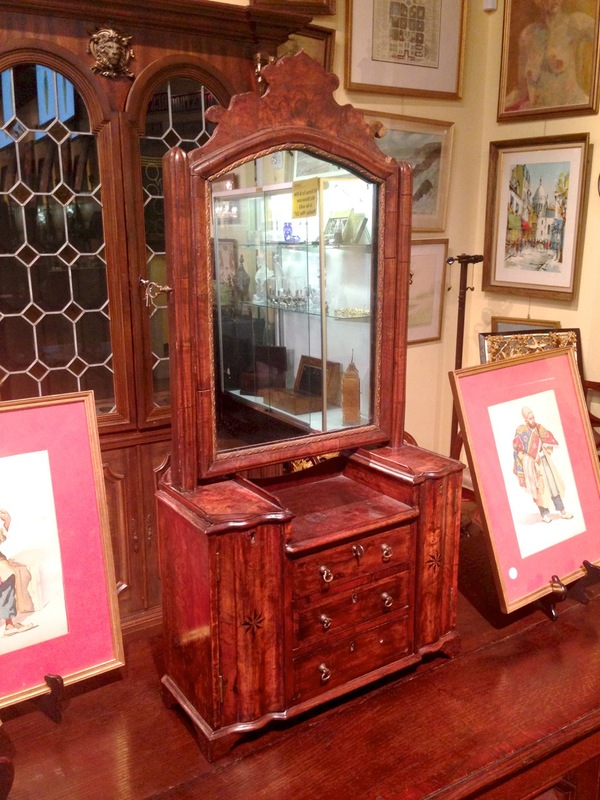 I visit a fair number of shops and auctions in a given week. 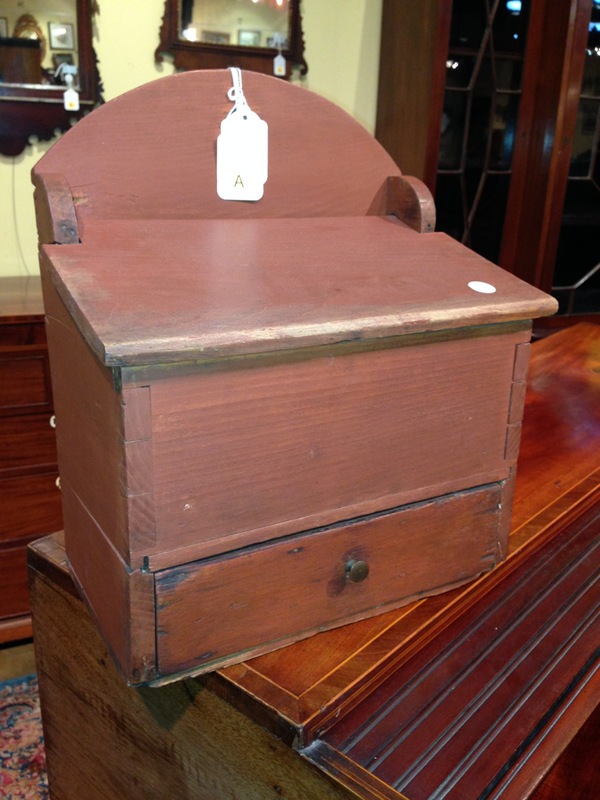 Not every shop or auction has enough content for its own set or blog. I accumulate the important stuff and share them when I think I have enough to make it interesting. This is one of those blogs. 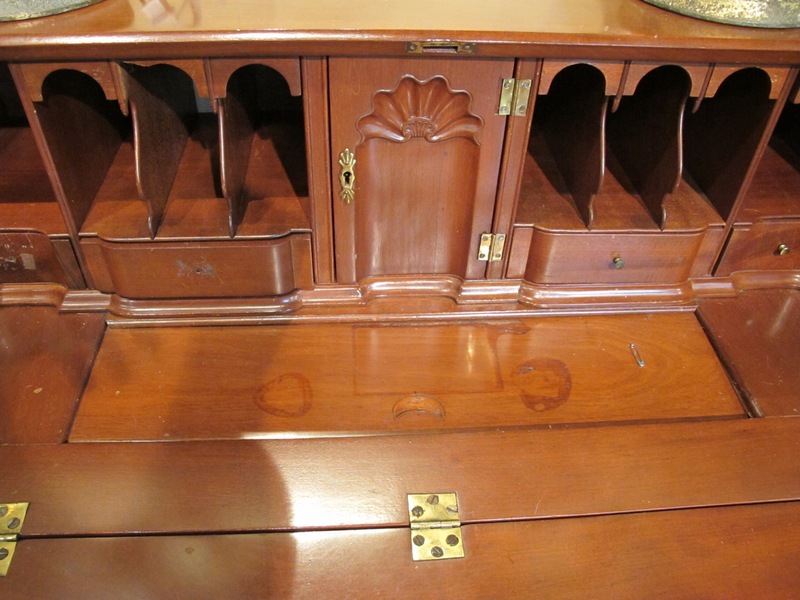 Lots of interesting furniture with no common thread. We might have seen this before. 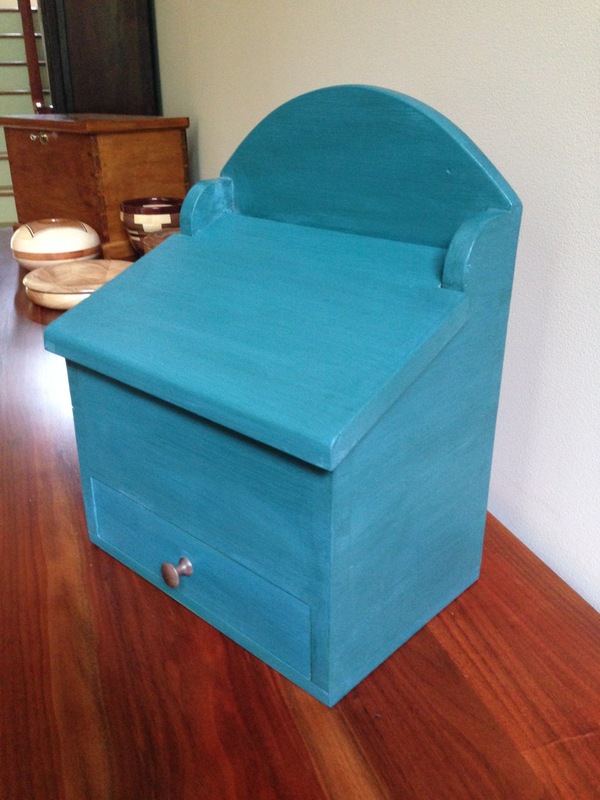 It’s a chest and it’s painted. Click HERE to see the entire accumulated set. Big stuff coming in the next week or so. I’ve been traveling.